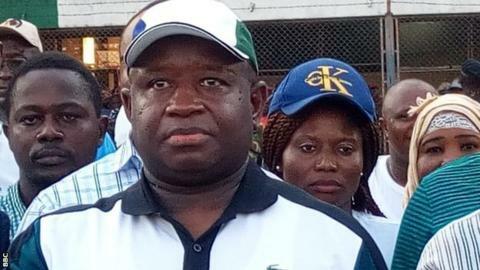 The government of Sierra Leone President Julius Maada Bio is giving financial backing to the running of the country's football league. Huge crowds have welcomed the return of league football in Sierra Leone after a four-and-a-half year absence. The league has resumed despite Sierra Leone being suspended by world football's governing body Fifa. Football was initially suspended due to the outbreak of deadly Ebola virus in 2014. Internal wrangles within the Sierra Leone Football Association (SLFA) meant the league was unable to resume. In all thirteen clubs are taking part in the Premier League, however FC Johnasen, the team owned and named after SLFA President Isha Johansen, was not invited to participate. Johansen has been set aside by the country's Anti Corruption Commission pending the outcome of a case against her, however she is still recognised by Fifa as SLFA President. The opening day of the league on Sunday was preceded by a colourful ceremony and a game between cabinet ministers and members of parliament. Ten's of thousands of fans arrived several hours before kick-off to see two of the country's best supported teams, Mighty Blackpool and East End Lions play each other. The crowd included Sierra Leone's president Julius Maada Bio, who saw East End Lions win 1-0 thanks to Alhssan Koroma's strike in the first half. The Siaka Stevens Stadium in Freetown was full beyond its official capacity of 35,000. It was the highest attendance for a domestic game since the 1990 Sierra Leone FA Cup final, when East End Lions lost 1-0 to Ports Authority. The match was also shown live on national television a first for the Sierra Leone Premier League. "I'm delighted that our domestic football is back, the turnout of the opening match was massive, I can't believe my eyes. It's clear that we're now ready to revive the game," Abdulai told BBC Sport. "After four-and-a-half years it's time to move away from the past and create a new future for both football and the young people who want to play football in the country. "Everybody is on board and this is a new dawn. I want to thank everybody including the Sierra Leone government who has given us large sum of money to run the league. "This is phenomenal, it's unprecedented that the government of Sierra Leone would put in such an amount of money." For the first time the Sierra Leone government is sponsoring the league and they have given the PLB more than US$230,000 and with the promise of a further US170,000 to come. President Bio says his government has given football back to the Sierra Leonean people as he promised. "This is just a fulfilment of a pledge we made that we'll make sure that football resume in this country," President Bio told BBC Sport. "I'm not at all surprise at the large turnout because my country is in love with football and the people are been longing for it, they've been missing it. "It's our responsibility to provide the funds for the league, it's a moral obligation that we owe to our people to make them happy, to give them what they want and if football makes them happy, we're giving it to them." The head of state also said he was concern about Sierra Leone's suspension and he hopes it'll be lifted as soon as possible. "We want to be part of the Fifa world, but of course we have to make sure that internally we do what we have to do," he added. "I'm sure before the end of our league the suspension would have been lifted. "We're not just paying attention to the local league, we are also taking action as the suspension is concerned too, so that it can be lifted as soon as possible." "As a matter of fact we're providing the match officials and technical support for the league. "We've also provided the match balls for the league as well as training balls for all the participating teams. "We playing the league with the hope that our suspension will be lifted by the time the league ends so that we'll be able to engage our clubs in African continental club competitions." The league is set to end in July with all the clubs set to play each other twice.